Society of Interventional Radiology President-elect Scott C. Goodwin, MD, FSIR, is the Hasso brothers’ professor and chair of radiological sciences at the University of California. Radiology Today (RT): What do you see as the Society of Interventional Radiology’s (SIR) key objectives as you begin your term as president? Goodwin: SIR leaders are considering how the society can inspire, cultivate, and promote innovation to improve patient care through image-guided therapy. We’ve thought a lot about the history of this specialty, why it has been successful, and what can we learn from that as we move forward. 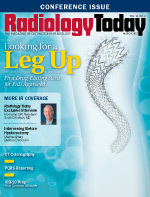 Clearly, innovation has been a key component of the success of interventional radiology. The main arm of the society that deals with innovation is the SIR Foundation, which specializes in developing investigators trained in conducting pivotal basic and clinical research. We continue to make our grant program more robust. For every dollar we’ve invested in grants to researchers, they’ve gone on to get $25 in subsequent total direct funding for their research programs. That represents a huge return on investment. With our new strategic plan, we are even more closely aligning the foundation’s goals with the society’s to invent new image-guided treatments that benefit patients. RT: What other objectives do you have for the coming year? Goodwin: After innovation comes validation. Once you’ve invented something, you need to demonstrate that it’s safe and effective. The foundation funds research that supports the validation process. We also work with the FDA and the different payers to determine their requirements for a device or procedure to be considered safe and effective. There’s also an education component to validation. Once a new procedure is proven to be safe and effective, we seek to educate our membership about it. For example, for more than two years, SIR has addressed an August 2010 FDA medical alert that detailed the possibility that retrievable inferior vena cava (IVC) filters could move or break, potentially causing significant health risks for patients. The society’s action resulted in a collaborative initiative with the Society for Vascular Surgery of the five-year PRESERVE (PREdicting the Safety and Effectiveness of InferioR VEna Cava Filters) study and the formation of its related IVC Filter Study Group Foundation. Our goal is obtaining a systematic, functional view that is representative of all the filters being placed in patients in the United States. We are making a final decision for a contract research organization, completing protocol development, and submitting the study for investigational device exemption. RT: At one time, when a new procedure was validated as safe and effective, it was put into use regardless of cost. Has the idea of safe and effective changed? Goodwin: I think this has changed. Early in my career, if someone came up with a new idea and initial theories showed safety and short-term efficacy, doctors would start using it. Now there’s a huge emphasis on comparative effectiveness research, particularly in the randomized controlled trial environment. For example, if you have an existing procedure, such as carotid endarterectomy, and then you come along with carotid angioplasty, the barrier to get the new procedure recognized as a safe and effective treatment in comparison with the existing procedures is much higher, particularly to get reimbursement for the new procedure. In the comparative effectiveness arena, there’s now a very high bar for some procedures. RT: Comparative effectiveness should be one of IR’s strengths. Patients typically experience a less invasive treatment and a shorter duration of care—which can translate to less expense—with good outcomes. All of these things should be a plus for the specialty, correct? Goodwin: The points you raise are important. IR patients return to work and other normal activities more quickly, and sometimes IR procedures are less expensive than traditional surgery. But what we really focus on now are outcomes. For example, in the carotid realm, there’s a big focus on stroke rates related to the procedure and then after the procedure. What are the mortality rates? You have to show advantages in those parameters as well as in terms of cost and quality of life. RT: Isn’t there more to it than good outcomes? Goodwin: That’s correct. Uterine fibroid embolization offers an example. Many randomized controlled trials show that this treatment is arguably safer than the surgical options and as effective in terms of quality of life. In some studies, it is more cost-effective. And, unarguably, patients go back to work and normal activities earlier than with more traditional procedures. Yet patients may still not be offered this as a treatment option. RT: What are some IR procedures that you think are in the validation phase and may play a more significant role once there are more data behind them? Goodwin: Treatments that have received a lot of attention recently are angioplasty of veins for multiple sclerosis patients, embolization of the prostate for benign prostatic hypertrophy, and renal denervation for the treatment of hypertension. Any one of these three could be extremely important. .
RT: There are massive potential patient populations for each of those procedures. Goodwin: The number of patients who could potentially benefit from renal denervation worldwide could be in the hundreds of millions. RT: Any other society objectives you’d like to mention? Goodwin: We’re looking at the extent interventional radiologists across all the countries of the world collaborate to innovate, validate, and advance the field together instead of making some advancements here in the United States while doing something different in Germany, Japan or elsewhere. SIR is actively reaching out to international societies. We attend and participate in international meetings, and our international colleagues attend and participate in our meetings. We also have programs in place, such as our visiting fellowships/observership program and international scholarship program for international physicians to come to our annual scientific meeting. The international scope of our scientific publication, the Journal of Vascular and Interventional Radiology, has increased. And while SIR has several membership categories within the society that are specifically tailored toward international interventional radiologists, we are equally interested in forming lasting collaborations abroad that go beyond the traditional boundaries of members. RT: Do you have any personal professional goals for this year? Goodwin: At the University of California, Irvine, we’ve just acquired a MR-guided high-intensity focused ultrasound unit. I’m hoping to get some projects off the ground that look at how that technology might help patients with fibroids or various tumors in the body. RT: With an aging US population, I’d guess that IR’s role in stroke care is growing. Is that the case? Goodwin: Intra-arterial therapy for stroke has been around for more than 15 years at the largest medical centers, yet the penetration into community hospitals is sparse. Part of the reason is that there just are not enough neurointerventional radiologists, endovascular neurosurgeons, or neurologists to provide stroke care for all the patients in this country. To help increase interventional radiologists’ numbers in these areas, the society offered the CLOTS (Catheter Lysis of Thromboembolic Stroke) course. This course, offered four times between 2009 and 2012, was particularly targeted to train interventional radiologists in stroke therapy. We hope that the interventional radiology community embraces stroke care and tries to improve the availability of intra-arterial stroke therapy in this entire nation. RT: Do you have a sense of how you see that unfolding? Is there acceptance among other physicians in the area? Goodwin: There is definitely a subset of interventional radiologists strongly interested in stroke. The society provides training that gives individuals a good first step toward being able to do that type of work. One of the challenges will be getting real-world, hands-on training for the people who have had that didactic training and some hands-on training in a laboratory setting. They need that experience to make sure that they are highly confident at doing that type of work. I think that might be one of the hurdles that we will face. RT: How important is collaboration among different specialists working in stroke care for increasing endovascular treatment options? Goodwin: Society of Neurointerventional Surgery members—whether they are surgeons, radiologists, or neurologists—and members of the neurology community are going to be extremely important to the future of stroke care, particularly as SIR and interventional radiologists seek to collaborate with them. RT: IR is widespread, yet you don’t hear much about it. How should the society increase awareness of the field? Goodwin: We perform as many procedures as orthopedic surgeons, yet awareness of interventional radiology is so low compared to orthopedic surgery. I think one reason for that is we haven’t controlled patients. We haven’t been as involved as we should have been in the so-called longitudinal care of patients. Just changing our practice pattern could improve recognition of the specialty. We continue to emphasize that interventional radiologists are clinical practitioners who see patients in consultation, decide appropriate treatment, deliver that therapy, and then follow the patient afterwards. That role is important and goes beyond just doing a procedure and not knowing much about the patient before or after. If you’re not participating in longitudinal care, then patients don’t know who you are, which I think is a problem for the specialty. We also need to do a better job of increasing awareness among hospital administrators of the importance of interventional radiology to the practice of medicine in a hospital system. To help with that, we created a hospital administrator track for the SIR scientific meeting. We continue to try to promote ourselves as board-certified doctors who specialize in minimally invasive, targeted treatments to patients, providers, administrators, payers, government regulators, and others. Our efforts include lobbying on Capitol Hill. RT: It comes back to getting the word out, how you control patients, and how you work with other physicians. So much of what IR does, somebody else does, too. How do you fight that battle? Goodwin: A hypertensive patient is an excellent example. Obviously, cardiologists are much more involved in the management of hypertensive patients, and many of them have invasive cardiology skills. It will be easy for cardiology as a specialty to transition from managing hypertension patients with medication to managing them with an endovascular procedure such as renal denervation. Interventional radiologists haven’t really been involved in managing hypertensive patients, so even though they have the skill and the interest to perform a renal denervation, how are they going to position themselves to appropriately accept referrals of hypertensive patients for consideration for that procedure? RT: So when interventional cardiologists start to learn those procedures, you’ll have that competition again. With that, where is IR going? Going forward, should IR be part of a diagnostic radiology group? Should it be separate? How do you see the practice of delivering IR services evolving? Goodwin: There’s a tremendous amount of conversation about that issue, particularly as it revolves around the development of the new dual primary certificate in IR and diagnostic radiology. At first, SIR advocated for a primary certificate in interventional radiology, which would have been separate and apart from diagnostic radiology. Under the American Board of Radiology, there would have been therapeutic radiology, diagnostic radiology, and interventional radiology. After many years of work, that has evolved into the dual primary certificate in IR and diagnostic radiology. Now you have a special training pathway that results in primary certification in diagnostic radiology and primary certification in interventional radiology. In the dual-certificate process, there is a much larger emphasis on the clinical practice of interventional radiology than has heretofore existed in the IR fellowship. With the dual certificate, there will be less diagnostic radiology training to allow for additional interventional radiology training. I don’t know what it’s going to look like 10 years from now, but we’re going to be transitioning from the diagnostic radiology residency followed by IR fellowships to the dual certificate, with more emphasis on the clinical practice in the specialty. RT: You followed the traditional path to IR. Would you have liked to follow the new training path? Goodwin: The same conflict on that topic that exists in the field exists for me personally: I was trained in diagnostic radiology and have some loyalty and a definite appreciation for that field. After I finished my fellowship in 1989, I became a full-time interventional radiologist and have been in a position to admit patients and run a clinic. The flip side is that I am relatively disappointed with how the field embraced the clinical practice of medicine. I wish the field had offered pre- and postprocedural management of patients more quickly. Had we been able to transition the entire field more quickly to a longitudinal care model, we would be more competitive with, for example, vascular surgeons, who now assume a huge percentage of the total endovascular care business from interventional radiology. RT: We haven’t mentioned it, but there is a great deal of interesting work going on in IR. Goodwin: That’s a huge growth area in the field. For some practices, it represents a substantial fraction of their work. It’s going to be an important subspecialty in interventional radiology as we move forward. As we go forward, SIR wants to emphasize what we call a service line approach to IR, which is not just learning how to do a procedure but learning about an entire field. Take interventional oncology as an example. If you’re going to be really good at it, you’re going to want to know about cancer in general, the assessment of a cancer patient, what the various treatment options are, whether they are surgery, interventional oncology, or medical therapy. You need to know the appropriate collaborative relationships and how to refer a patient appropriately for chemotherapy or other treatments. The most successful interventional oncologist is not going to be someone who is just good at radio-frequency ablation or cryotherapy of a tumor but someone who will understand that particular cancer state in its entirety. That person will understand its epidemiology, pathology, pathophysiology, the typical natural course of the disease, all the different therapies that are directed at that disease, and how interventional oncology fits into the spectrum of those treatments. That will be the individual who will be most successful. RT: With more data behind these procedures and as people in the oncology field see the value of what interventional oncologists can provide, do you think interventional oncology procedures can move forward to become frontline cancer treatments? Do you think interventional oncologists will be seen as frontline members of the cancer team? Goodwin: If interventional oncologists are not frontline members of the team, then they will be relatively sidelined in the management of those patients. To be a frontline member, they are going to need the full cancer treatment skill set that I outlined. They will not just stick a probe into hepatocellular carcinoma and cook it. They will have to understand the epidemiology of hepatocellular carcinoma and its natural history and what are the other available therapies. You need the whole gamut of knowledge about that disease state. The individual who has all that knowledge will be a valuable member of the team. RT: Being a valuable member of the team seems to be an objective for interventional radiologists. However, it also seems to be a difficult challenge. Many of the skills an interventional radiologist needs to be successful seem to be skills he or she needs to pick up on his or her own vs. being a part of the natural course of training. How do you deal with that? Goodwin: That’s why training is in evolution. Our hope is that the new dual primary certificate in IR and diagnostic radiology will result in more available time and emphasis on clinical practice. The new training is coming out. You are correct, to some extent, that people from prior generations had to embrace and learn about the clinical practice outside of their training environment. Frankly, it’s also an economic issue because the evaluation and management codes don’t reimburse nearly as well as procedural codes. But to follow a good patient care model for the long run, interventional radiologists must do the evaluation and management work, have clinic, and see patients. We have to make that investment in our practice and in the quality of care of our patients. I think that, over the last 20 years, this has become more recognized by individuals practicing in the specialty.